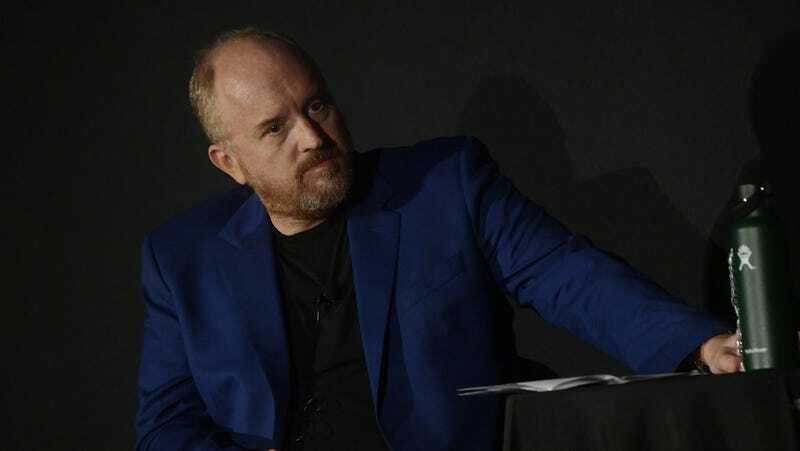 At the end of August, Louis CK came out of hiding for a surprise set at the Comedy Cellar in New York, just 10 months after a New York Times story confirmed rumors that CK had a habit of exposing himself to female employees and other comedians (CK later admitted that the allegations were true). He suffered some professional setbacks, including losing his lucrative FX deal, getting fired from The Secret Life Of Pets 2, TBS scrapping a cop show he was developing with Albert Brooks, and his film I Love You, Daddy getting pulled (with star Chloë Grace Moretz recently saying it should never be released). Evidently, CK has decided that he has paid his penance, because on Sunday night he returned to the Comedy Cellar once again for another surprise set. According to The New York Times, CK chose not to address his history of misconduct, just like last time, and there was apparently a “wild applause” when he took the stage and a “warm send-off” when he left. That being said, he apparently made some jokes about his daughter that The Huffington Post says made some of the audience uncomfortable, and at least two women walked out during his set. All of this is totally fine with the Comedy Cellar, though, which has adopted a new “Swim At Your Own Risk” policy since CK last’s surprise set. In a disclaimer that appears on tickets and on a sign inside the club, the Comedy Cellar warns that they “never know who is going to pop in,” and you’re free to leave if an “unannounced appearance is not your cup of tea.” The notice even ends with, “No questions asked, your check on the house,” as if they’re doing a great service to anyone who doesn’t feel like paying money to see an admitted creep be celebrated like a hero. This notice is particularly surprising given Comedy Cellar owner Noam Dworman’s reaction to CK’s previous surprise set, which he knew nothing about in advance and said was “nothing but a difficulty” for the club since it was suddenly the center of a big controversy on if/when harassers like CK are allowed to reemerge. If that were true, Dworman could easily stop CK from randomly showing up like this again. Instead, his club adopted a policy that makes it the audience’s responsibility to avoid people like CK. This “Swim At Your Own Risk” thing may seem like a nice way for the club to remain hands-off in the debate about whether it’s alright for CK to try and move past his misconduct, but the Comedy Cellar has very clearly chosen a side here. Owner of the Comedy Cellar had no idea Louis CK was going on, calls set a "missed opportunity"